Today I am sharing a look that incorporates some of recent favorites. These shorts, top, and bag have been on constant rotation lately. Not coincidentally, they all came together to form one of my favorite outfits. 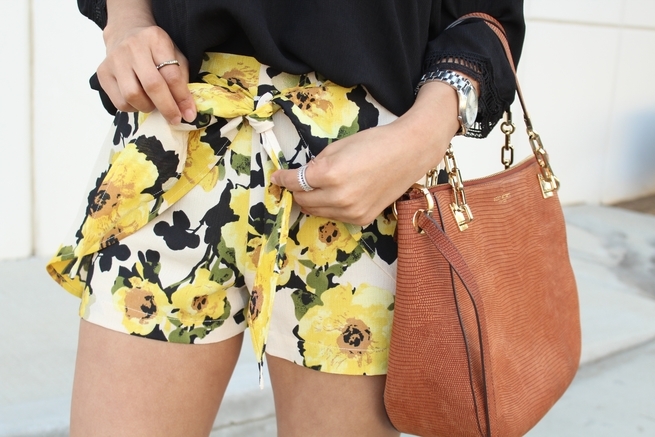 I adore floral prints- and these shorts are the clear reason for that love. They just scream 'Spring' and the color is so vibrant I can't help but feel good. Mellow in some yellow. How fun are your shorts? I love the vibrant color and it goes so well with your gorgeous off-shoulder top!